Joy Creek Photo Archive (c) all rights reserved Polemonium reptans 'Stairway to Heaven' (PP15,187) was developed at the New England Wild Flower Society Native Plant Nurseries at Garden in the Woods, MA. 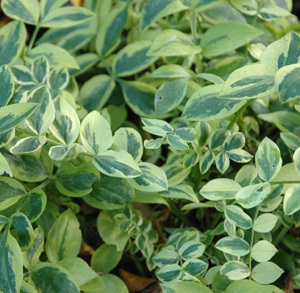 This variegated polemonium has dark green leaves margined in cream. They form a mound about a foot high with 4-inch flower spikes. This is easy to grow unlike other variegated forms. Spring and early summer. 12 in. x 12 in.